It seems as though everyone is on board the zucchini train right now, and I don’t blame them; you can’t walk into a farmers’ market or grocery store without seeing piles of them waiting to be purchased. I don’t know if the midwest is the hardest hit, but every year we have a massive quantity of locally grown zucchini to find homes for; it’s really quite stressful finding good families for them. This year, I’m doing my part for Operation: Adopt a Zucchini by offering up not one, but rather two recipes to help you with your homeless veggies. After all, it’s not their fault there’s so many. Thank heavens they’re so versatile. Before you take to Google, there is no actual “Operation: Adopt a Zucchini” program. Although it’s worth considering as an idea. 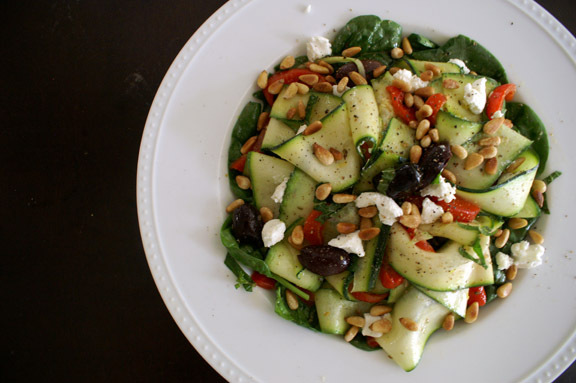 First up, my farmers’ market monday post: a simple zucchini ribbons salad with a greek twist. I’ve always wanted to make one of these, because they’re just so dang pretty, but I’ve gotten around to it. As luck would have it, zucchini ribbon salads abound on the interweb, and I had my pick of any style and flavor I wanted. I chose this one from Gourmande in the Kitchen because it looked like exactly what I would think of to do with raw zucchini, were I creative enough to think of it all on my own. But, you know, I’m not. And I almost exclusively make my recipes from cookbooks both owned and borrowed, but this is one of the few exceptions, and I had to make it; the ribbons were calling to me, and there were homeless zucchini on the line. Every minute counts in a situation like that. 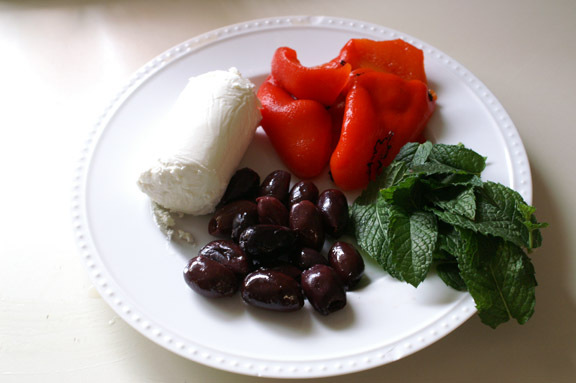 The salad was simple and beautiful, and it inspired me to Greek it up a little; I already knew how I wanted to make it my own. I think I’ve made it clear how much I love greek salads, and this one was just waiting for a little herb action in the dressing. I added some coriander, oregano, a touch of fennel seed (optional; I know some of you dislike the fennel), and the smallest hit of Dijon mustard to give it a little body. On to the veggies; because I love zucchini on its own, but I also love them as a carrier pigeon of sorts for other flavors. I’ve been craving some roasted red peppers lately (but haven’t been craving roasting them myself) so I bought some jarred red peppers, which for me work perfectly in this salad. If you want to roast your own, please do; out of necessity, I need a speedy-to-put-together lunches, and the zucchini ribboning took precedence this time. I loved it. The herbs, none of them strong, made a nice addition to the flavor, and the sweetness from the red peppers melded beautifully with the slight tartness of the dressing. The goat cheese and pine nuts which topped the whole thing off were essential to rounding the salad out and taking it from “veggies with some vinaigrette” to “satisfying lunch.” And I’ll be the first one to say that toasting nuts isn’t always a requirement; for instance, pecans are just as delicious toasted or untoasted. Pine nuts, however, really deepen in flavor upon toasting, so please don’t skip that step. You can buy them toasted, but I’ve never found them to have the same flavor as when you take a few minutes and do it yourself. In other news, I’ve got so much stuff coming up for you in the next few weeks. My mind has successfully kicked over into fall ideas, and hopefully I make a graceful transition from bright, mid-summer fare to recipes which make you think, just a little, about how much you’re excited for cooler temperatures, school starting up, and fall flavors. Before all that, you’ll get one more recipe for how to use up all that zucchini you have lying around; next time, it will be a sweet take. Or rather, I should say a sweet double take. Just you wait and see. 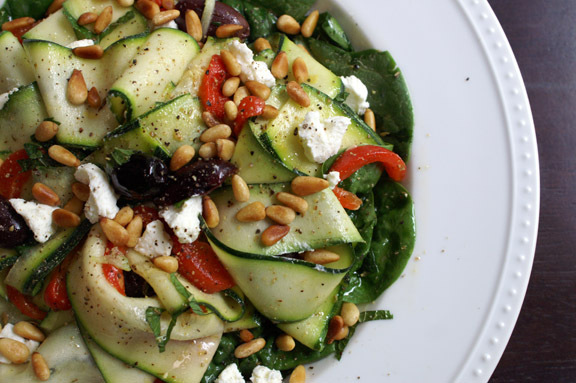 Adapted from Gourmande in the Kitchen‘s recipe for Raw Zucchini Salad with Olives and Mint. You can find the original recipe here. *this may sound like a lot of zucchini; it is. It’s because you can’t use the middles so much due to all the seeds; the good stuff will be on the sides. You’ll use your peeler to work your way to the middle of one side, then once the seeds start to appear in droves, you flip it over to the other side, again working towards the center. You’ll know (and your peeler will let you know) when it’s time to flip. In a dry skillet (I use my All-Clad regular skillet versus a nonstick one), toast your pine nuts over medium heat, flipping frequently. This should only take 4-5 minutes. You’ll start to hear them, smell them, and see them darken in color. Once you see the first signs of toast, do NOT take your eyes off them, and increase your flipping around to be sure they evenly toast and do not burn. No one likes a sizzled nut. In a small bowl, whisk together your olive oil, lemon juice and zest, coriander, fennel (if using), oregano and mustard until emulsified. Season with sea salt and ground pepper. Take your zucchini, ends trimmed, and lay it on your cutting board. Using a sharp knife (or the peeler), peel the first strip or two off your zucchini so you don’t have an all-dark-green ribbon. Take your peeler and begin peeling ribbons, top to bottom, applying even pressure with your peeler. Once you start seeing lots of seeds and feeling like the peeler is catching on them, flip your zucchini to the other side and repeat the process. 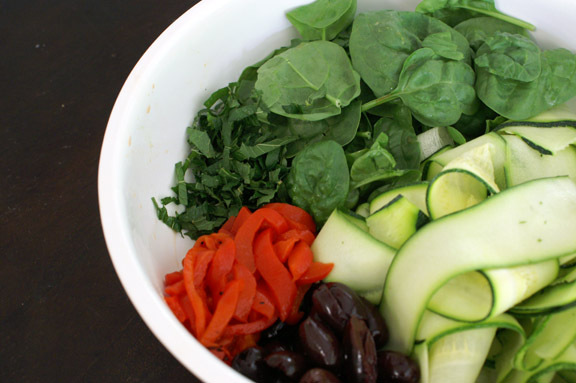 Add the ribboned zucchini, red peppers, greens, olives, and chopped mint to a large, shallow bowl. 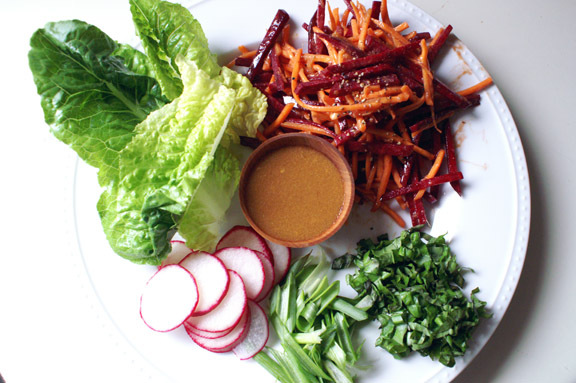 Add as much of your vinaigrette as you wish (remembering that you can’t “un-add”) and toss with your hands gently until your ingredients are evenly coated. 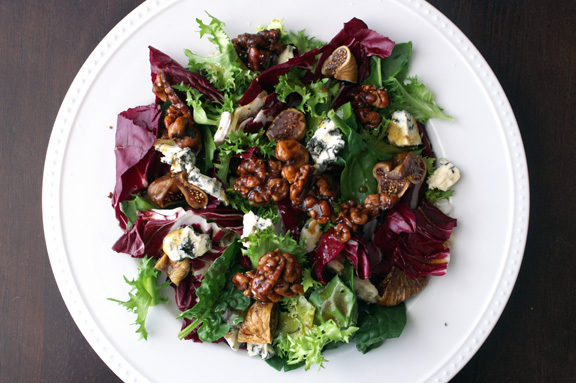 Transfer portions to salad plates, top with desired amount of goat cheese and toasted pine nuts, and season with sea salt and fresh ground black pepper. Serve immediately. 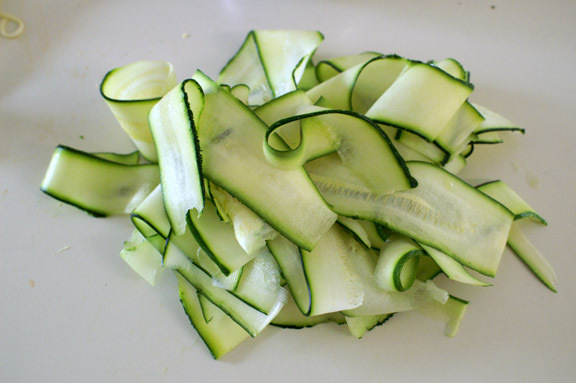 Was slicing the ribbons of zucchini as satisfying as I imagine it to be? I kind of want us to run a 5K with you. We could raise money for the Adopt A Zucchini program. The t-shirt possibilities are endless. It was exactly as you imagine it: almost spa-like. They should actually offer that as a service at day spas; you could slowly and gracefully peel zucchini and then toss it with other ingredients using only your hands and inner peace. then you could eat lunch. I kind of COMPLETELY WANT TO US TO RUN A 5K TOGETHER IN HONOR OF THE AAZ (ADOPT A ZUCCHINI) FOUNDATION. i can’t even think about the tee shirts or my head will explode. we’re putting this on our “life: to do’s” agenda for next year. I’m officially in training. we all really need to get together (read; go somewhere fun) for a strategic planning session. or something official sounding we could do every year. I just got a new peeler. After so many times hurting myself during prep work for huge batches of applesauce (peeling the apples by hand because they were soft Cortlands and my faulty apple corer/peeler thing wouldn’t work with it), I finally allowed my mother to gift me a new peeler. The old one looked antique, and pretty, and dull! So quaint. But the new one is splendid. I one day hope to get a mandoline! It’s my dream kitchenware. mandolines are GREAT. i never thought i needed one, and i received one for christmas years ago and it sat in the box forever. once i started cooking “full time,” it has changed my life in terms of slicing/chopping. put that on your christmas list for SURE. Last year, I had a veggie patch. I had lots of zucchini. This year I don’t have a veggie patch. And I want lots of zucchini. 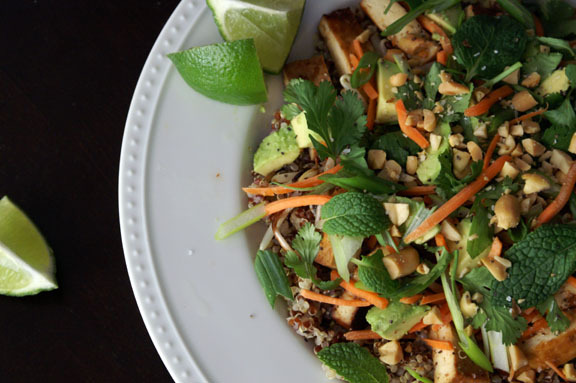 (And this salad.) Zucchini ribbons are about the prettiest version of any veggie I can think of. My mother used to say that farmers in the Valley (where I grew up), used to say that you knew it was zucchini season when people would wake to find their unlocked cars filled with zucchini. Lock your doors people. Lock your doors. People were just joking about this at our farmer’s market last weekend. Can these rural folk think of nothing but gift giving thievery? I HAVE NEVER HEARD OF THIS. I had no idea zucchini prompted such rash acts. Can I just ask if you feel like ribboning the zucchini makes it taste better? Because I feel like maybe it does. I liked it chopped, but i love it in ribbons. That’s like, fairytale robbery. And now i’m locking my car doors. Or unlocking them; I can’t decide. I’m joining up. Farmers’ Market Monday sold me. it’s great to have you!! Farmers’ market monday has been my favorite series to do; I know soon i’m going to need to morph it into something else (because most of our farmers’ markets close on or around november 1) but it’s going to stay veggie-centric and seasonal. I’ve had the best time and learned so much about seasonal flavors this year, i can’t give it up.